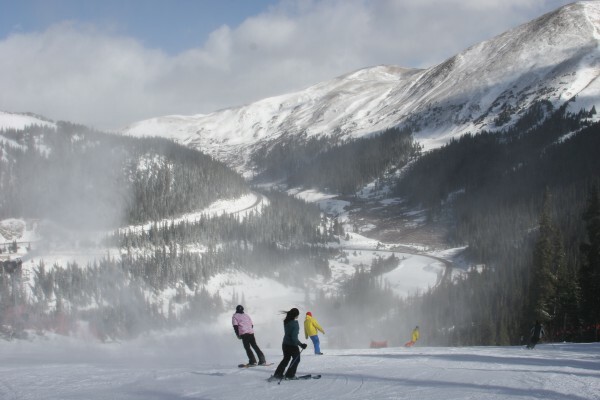 Thanks to cool temperatures and late-season snow, Arapahoe Basin Ski Area (A-Basin) has extended the Colorado ski and ride season for another weekend. Arapahoe Basin will be open seven days a week through June 2, 2013, and will reopen for summer skiing and riding on Friday, Saturday and Sunday, June 7, 8, and 9, 2013. “With all the spring storms, our exceptional snow conditions, and our guests’ enthusiasm for skiing and riding, it only makes sense to open for another weekend,” said Alan Henceroth, Arapahoe Basin’s Chief Operating Officer. During this summer ski season extension, A-Basin will offer top-to-bottom skiing from the Black Mountain Express and Lenawee Mountain lifts. The Lenawee Mountain lift will run from 8:30 a.m. to 2:30 p.m. and the Black Mountain Express lift will run from 8:30 a.m. to 2:00 p.m. on June 7, 8, and 9. There will be no beginner skiing or riding. Black Mountain Lodge at mid-mountain will be open with a full bar and barbeque during ski area operating hours through the extended weekend. The A-Basin rental shop and the Arapahoe Sports retail shop (with all items marked down 40 percent) will also be open during this time. Discounted lift tickets for the summer ski season will be available in advance at tickets.arapahoebasin.com. Tickets purchased at the ticket window during the extended operating weekend of June 7, 8, & 9 will cost $45 for adults (ages 19+), $35 for youth (ages 15-18) and $25 for children (ages 6-14). Children 5 and under ski and ride for free. Arapahoe Basin 2013-14 Season Passes are on sale now at the lowest prices of the year: $269 for adults (ages 19+), $199 for youth (ages 15-18) and $139 for children (ages 6-14). A-Basin 2013-14 season passes that have been paid in full can be used for the remainder of this season, including the extended summer season days. More information about open runs, snow conditions, weather, and ticket and pass pricing can be found online at arapahoebasin.com. Sounds good to me! I love skiing in the summertime. MtnTownViews.com is MTN Town Magazine‘s daily journal blogging about Colorado’s mountain towns and resorts. Like them on Facebook and Follow on Twitter. Click the cover to read the Winter 2012-13 Issue.© 2013 MTN Town Magazine. All rights reserved. Republication, in part or entirety, requires permission.